Muhammad Mossadegh's legacy is complicated, often misunderstood, and overlooked. Muhammad Mossadegh was born in Tehran, Iran in 1882 to an upper class family which allowed him to live a financially comfortable life and for him to be educated in Paris and Switzerland. He recieved his PhD in law and became a constitutionalist who believed a constitutional monarchy like that of the one in Britain was the type of government Iran should become. His political career never did follow a straight line and more than once he retired. Eventually he became Iran’s Prime Minister before those he had angered threw him out from office in a coup. Mossadegh would often threaten to resign his positions over the most trivial of issues to the point it was almost comical. He was seemingly plagued for most of his adult life by ill health. He always appeared frail and looked at least a decade older than his actual age. He conducted his business often from a bed while wearing pajamas. Mossadegh would often use the appearance of his ill health to gain sympathy from those he wished to manipulate and was known on occasion to faint in meetings and in public. Doctors could never determine what was behind his seemingly frail health and there certainly seems to be a psychological element behind it. Often stress from events would bring on bouts of illness probably both real and imaginary. Even though he was western educated and admired the British constitutional monarchy, he despised the country. He once said about the British to an interlocutor, “You don’t know how evil they are. You do not know how they sully everything they touch.” The issue that he became most passionate about was the issue of British rights to Persian oil. Before World War I, Winston Churchill as First Lord of the Admiralty made the decision to wean British naval ships off coal power in a switch to oil. Switching to oil allowed naval ships to become faster, be refueled at sea, and be equipped with larger, more powerful guns. It was a controversial decision. Britain had plenty of coal, but did not have large domestic oil reserves. To get oil, it had to be shipped from allies abroad and therefor the supply chain could be much more vulnerable in times of crises. One of the key places to get oil was Iran, and by June of 1914 Britain bought a 51 percent share of the Anglo-Persian Oil Company to keep the Royal Navy powered by oil. In 1932, during the world economic crises, Reza Shah became incensed over how little royalties Iran received from the oil concessions with the Anglo-Persian Oil Company. For years, despite oil revenues financing Reza’s army, Iranians had strongly felt the country was being fleeced. When Reza Shah announced the agreements with the British over the Anglo-Persian Oil Company needed radical revision, the Iranian public celebrated by holding illuminations and festivals all over the country. One of those who had felt the country was being fleeced was Muhammad Mossadegh. He watched the renegotiations closely. At this point in his political career Mossadegh was in one of his self-imposed retirements due to disagreements with the then current regime. He had already been elected to the Majles, became governor of multiple provinces, served as finance and foreign ministers. Mossadegh felt deep humiliation for Iran when the Shah failed to negotiate terms that were not much better than they were before with the further sting of oil concessions being extended all the way through 1993. Despite Reza Shah’s nationalistic rhetoric, many had come to view him as a British lackey. By 1944 Muhammad Mossadegh was back in politics and elected again to the Majles. But this time he was head of the National Front, an organization he founded on establishing democracy, ending foreign presence in national politics, and nationalizing the Anglo-Persian Oil Company. After an electoral-reform bill he backed failed to pass through the Majles, Mossadegh once again went into retirement. He would remain in retirement until he was appointed Prime Minister in 1951. Once he was Prime Minister of Iran, he moved to nationalize the Anglo-Persian Oil Company. The move not only turned Britain into an enemy of Mossadegh, it also wrecked the Iranian economy. What Mossadegh paid little attention to is that the Iranians alone did not have the technological know-how to run what remained of the Anglo-Persian Oil Company. The country’s oil revenues disappeared overnight and other oil companies and countries refused to lend help in a show of solidarity with the British. Britain did what it could to resolve the issues between Iran and the Anglo-Persian Oil Company to no avail. 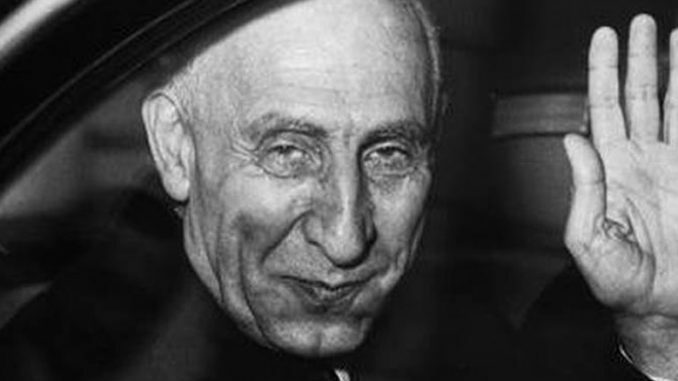 In 1952 Mossadegh declared Britain an enemy and cut off all diplomatic relations. Britain turned to America for help, but found the Truman administration to be unsympathetic over Britain’s policies in Persia. This changed with the new administration of President Eisenhower. Prime Minister Winston Churchill was able to convince the Eisenhower administration that in the new era of the Cold War, Mossadegh was a risk and could pivot Iran towards the Soviet Union. After all, Mossadegh’s government was formed by a coalition with the pro-Soviet Tudeh Party. Keeping the Soviet’s hands off the Middle East and its oil had become a priority in the Cold War. It was not long before the U.S. hatched a plan to throw Mossadegh from power in exchange for installing the pro-American Mohammad Reza Pahlavi as Iran’s ruler. Using propaganda to incite protests and political riots, along with the help of Iran’s military, Mossadegh found himself overwhelmed as tanks and a mob surrounded his house on August 19th, 1953. He barely escaped alive, but was found and arrested hiding in a nearby house. He would spend the next three years in prison and then spend the rest of his life under house arrest at his home in Ahmadabad. He died in 1967. While in ousting Muhammad Mossadegh and installing Reza Pahlavi the United States and Britain got their way, however, the story did not stop there. Pahlavi turned out to be a brutal dictator that in many ways repressed the people of Iran. He was thrown out of power in the 1979 Iranian Revolution which galvanized American politics when 52 American embassy diplomats were held hostage. That event crippled Jimmy Carter’s presidency. During the Revolution, Mossadegh’s nationalism and the American backed coup where rallying points for the public. Mossadegh’s nationalism was complex and unique. He had many detractors within his own country. In a way, his nationalization of the Anglo-Persian Oil Company was ahead of his time. Just three years after he was forced from power Egypt’s Gamal Abdel Nasser nationalized the Suez Canal in 1956, a suggestion Mossadegh had once made. This led to Britain, France, and Israel into a botched war with Egypt—one that ended with the humiliation of the West. In the decades that followed, nationalism spread across the Middle East and the West was vilified. One of the first acts Mossadegh performed when he became prime minister was to tell the police not to arrest any newspaper editors. Up until that point newspaper editors risked arrest for writing anything insulting about their country’s prime minister. “Let them write what they want!” he said. There is also the story of his wife, Zahra, who was in the car when her driver was pulled over for entering a street with a no-entry sign. When the driver pointed out that the Prime Minister’s wife was in the back seat, the police officer said, “I don’t care who it is,” and continued to demand the fine. When Mossadegh learned of this, he immediately phoned the police chief and had the officer who pulled his wife’s driver over promoted to head the traffic police. With history being hindsight, it is clear now that Mossadegh had no intentions of allying himself with the Soviets and the orchestrated coup was a severe overreaction. In fact, he deeply respected America. But during the Cold War the truism that Cardinal Richelieu had written over three centuries before was alive and well— “In matters of state, he who has the power often has the right, and he who is weak can only with difficulty keep from being wrong in the opinion of the majority of the world.” The overthrow of Muhammad Mossadegh and replacing him with what turned out to be a brutal dictator is regrettable. It is a mistake that still haunts America’s relationship with Iran to this day.